Whenever I travel, within the country or out of it to meet with family and friends, I always prepare something from my kitchen. I enjoy cooking for my family and friends. These days I am always careful about what I can take for everyone. 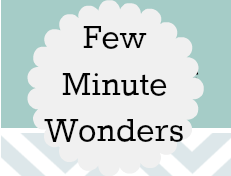 With allergies becoming very prevalent among most people I want to be extra careful. 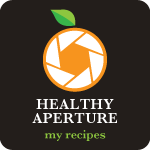 This week I wanted to make the dairy free version of coconut burfi, as I have already posted on with dairy here. It is a stove top version and can be done easily. 1. Heat the kadai with ghee. Once the ghee melts add the shredded coconut and cook it so that all the water would evaporate from the coconut. 2. Add the coconut sugar and mix well. the sugar will melt. Keep mixing the coconut and sugar until to comes together in a ball. 3. Transfer to a prepared tray and allow for it to set. Place it in the fridge and then cut them into squares. This is one easy sweet i first ever tried! yours looks perfect, nice trick of lining the tray with foil! 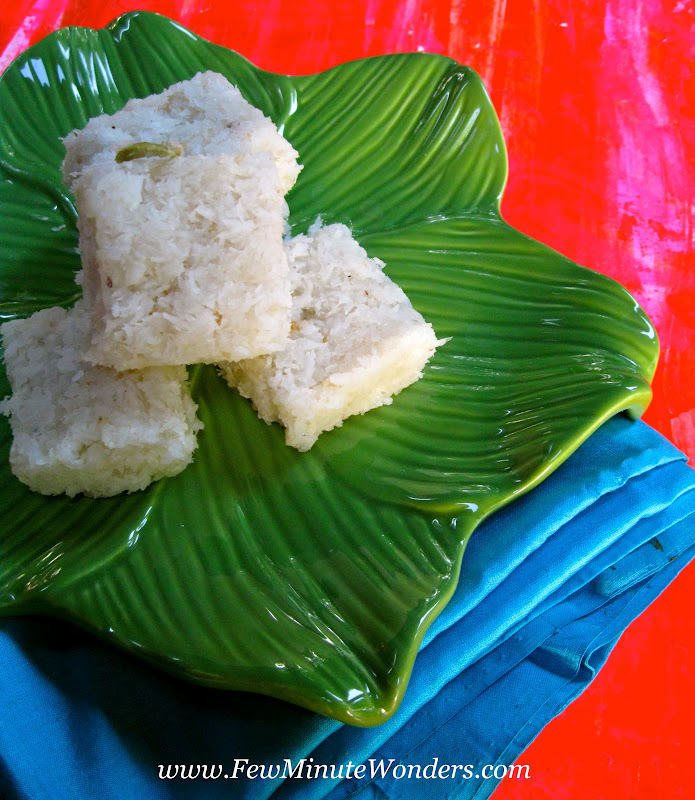 Coconut burfi looks tempting.. And loved this version too wee do prepare it the same way!! 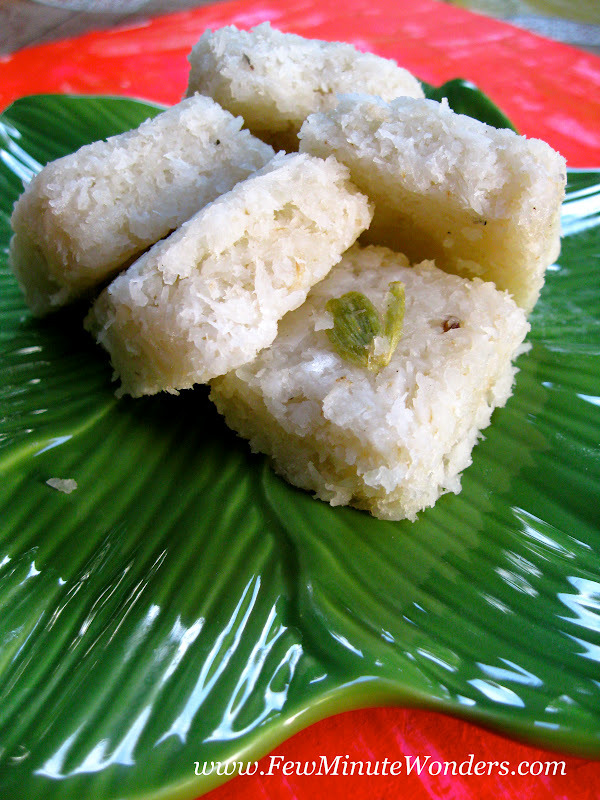 Coconut Burfi Looks YummYYY !!! wow.. looks very delicious. perfectly made..
Yummy yum delicious burfi,looks perfect!! wow.. that looks so good. simple and easy to make. One of my favorites, very nicely done.. Your pics had me longing for some of this. I love coconut burfi. But if this contains ghee, how can it be dairy-free? Perfectly made burfi!! My fav.. Yum yummm!! The ghee is a dairy product..so this is not a dairy free version ..
Glad to follow you !! 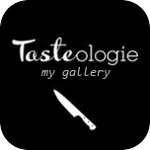 plz do visit mine in your spare time !! Ghee is not dairy free, its a product derived completely from animals, since its made of butter, which is derived from cream, which is derived from milk. So this product is completely derived from animals. if anyone is a vegan, this is not a product for them and cannot be called 'dairy free'. If what you meant as dairy free was a term instead for lactose intolerant or cassein intolerant, then you can specify that instead since the clarified butter has very minor amounts of lactose and cassein. So its a good product for people intolerant to these, but that does not make it a vegan/dairy free product. The burfi looks so deliciousss and perfect! I love simple burfis. I seem to have missed quite a few posts here! Looks nice. Strange so many of us made this sweet this week! well written article. I'll be sure to bookmark it and return to read more of your useful information. Thanks for the post. I will certainly return.